I love frameworks. As soon as I dropped my programmer’s ego and learned to embrace well conceived conventions over configuration my development and deployment times felt the benefit. On the other hand, I like understanding what is going on underneath the hood which there is a danger of losing sight of when using a framework. And this brings me to why I love node.js and express. For me they provide an boilerplate for a framework: the tools I need to quickly build my own conventions. For sure, it’s pretty easy to build a site with express as it is, but shifting express closer to a MVC setup is simple. M is for model. A place to define data structures and methods to interact with your data store. V is for view. A place to manage everything the end user sees on his or her screen. C is for controller. A place to take user requests, bring data from the model and pass it back to the view. And that’s enough of that for now. Here’s how I arrange my express apps into a basic MVC structure. First of all I need three folders in the root of my app. Much of this file is standard if you are generating your app with express, but there are some important lines. Line 5 is where we include the native fs module so we can dynamically read in our controllers. Then in lines 25 to 30 we read in all js files from the controllers directory. Line 13 is pretty important too as it tells express where we want to store our views. I choose to include my models on a per controller basis (lines 1 to 2), so in my MVC structure they are required in each controller. As modules are cached the first time they are loaded there is no overhead in doing this. Moreover I like having the reference to the models I am using in the file I am using them in. Line 3 exports all of our routes in the controller function. From here on in you can use the express way of defining routes. But notice that I set my views like this: res.render('users/signup') which results in the view being loaded from views/users/signup.jade in this app. I like doing things this way because the controller is mediating both the models and the views which for me is the spirit of MVC. There is also a huge organisational win too: if I want to work on users/signup I know I that my model is in models/user.js; my route is in controllers/users.js and my view is in views/users/signup.jade. And that is what makes MVC such a great pattern. I’d recommend anyone interested in learning about MongoDB to give it a go. The course is 6 weeks long and you also get to learn a bit of Python along the journey. 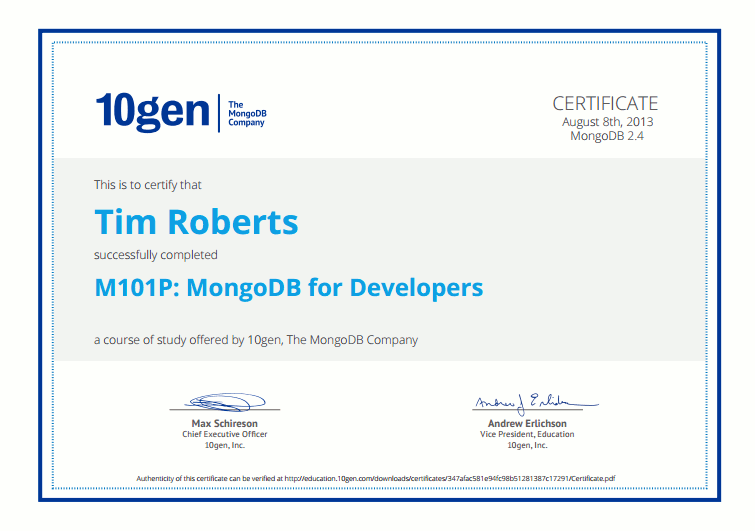 As it’s offered by 10gen, the company who develop MongoDB, it’s probably the best source of learning on the subject. There are a few courses specialised by language which you can find on their list of mongodb courses. I’m now on my first week of MongoDB for Node.js developers, and I hear there may be a C# one in the pipeline. In a nutshell: SES is a reliable way to unload the burden of sending emails. Here’s how to harness Amazon’s Node.js SDK to send emails. The example below is a raw Node.js app, but should be easy enough to integrate with your framework of choice – e.g. Express / Geddy. I’ve posted all the code in an example on github. An Amazon AWS account with SES enabled. Your Amazon Key and Secret. Verfiy an email address at SES. First, install the Amazon SDK. The ses.sendEmail passes a json string with the necessary parameters required by Amazon SES. This example sends a text message, but if you look over the docs for the sendEmail call you will a HTML version can be easily passed (along with a host of other parameters). The callback function accepts the defacto err argument for collecting any errors and above use the second parameter data to output the information the service sends back on a successful send. The next logical step in this script would be to read in a text file for the body so you can send templated emails. Look to Node.js’ fs to achieve something like that. You could also wrap this functionality in a module so you can reuse it across your app with a more succint syntax.. In a nutshell: here is how to add elegant validation with a useful error message for a field being unique. This is great for usernames, email addresses etc. that can only appear once in your collection. Line 16 onwards are the ones to note. It’s a custom validation rule set on “email”. What’s important is that it adds a callback to the validate function which I have arbitrarily named respond. Notice that I can now search for an existing user and in the callback for that search, if a user is found, I can return false to my validation by passing false through my respond callback.